Throughout my time at UW and LSU, I have been involved in many campus organizations and projects serving my school and the surrounding community. Honors College service project planting marsh grasses and trees in Port Fourchon, LA as part of coastal restoration projects with the Barataria-Terrebonne National Estuary Program. Landscape work at a Habitat for Humanity site. 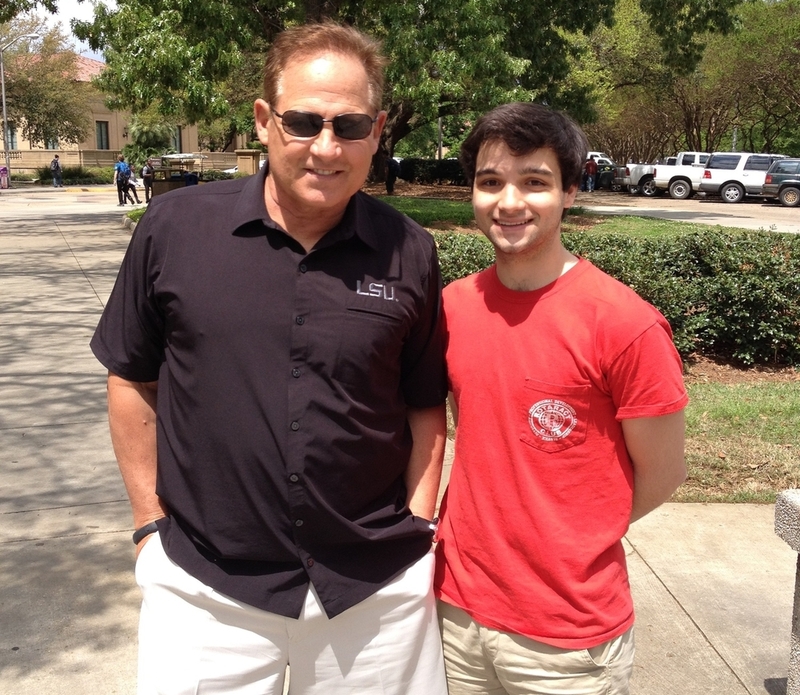 At Rotaract's Kiss the Pig with participant and LSU football head coach Les Miles. Fellow Rotaract members working near David Boyd Hall on Spring Greening Day. Photos taken at Rotaract events and service projects. Rotaract's Kiss the Pig - Rotaract LSU's main philanthropic event, which occurs every year raises funds for the Leukemia & Lymphoma Society by selecting campus celebrities to partake in a competition attempting to amass the highest collective donations. 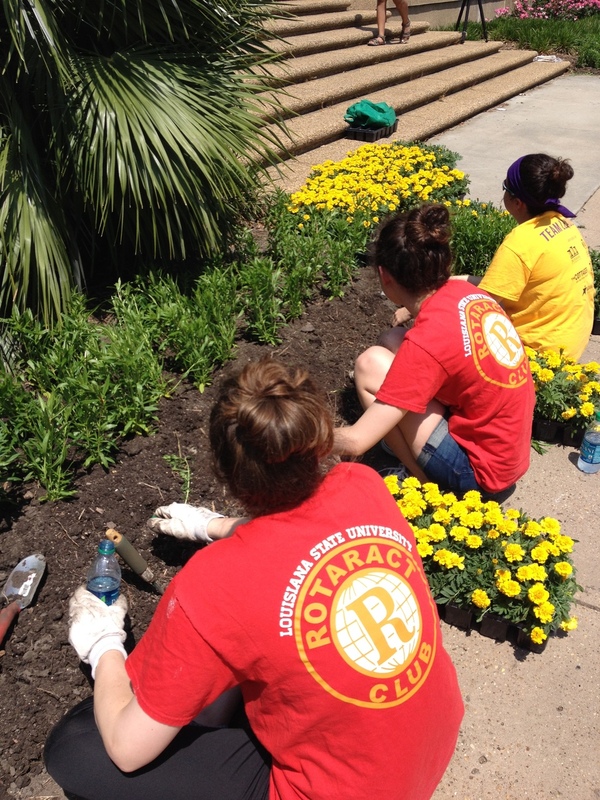 During the spring, members of Rotaract LSU promote the event and accept specified donations to go to the competitors’ behalf in an endeavor to publicize the fundraiser and constantly raise the stakes. Winners, or participants who raised the most funds, have to kiss a pig at the highly anticipated reveal event held in front of the LSU Student Union where the year’s grand total is announced. Greater Baton Rouge Food Bank - sorted food donations and packed lunches for students at nearby schools to help feed the hungry in Baton Rouge and the surrounding parishes. Habitat for Humanity - worked on landscaping at a Habitat for Humanity build to help enhance connection to preserving the environment. LSU Spring Greening Day - participated in campus-wide event assisting in campus beautification projects aimed at promoting the importance of campus sustainability. BREC - served at several of the BREC (East Baton Rouge Parish's Parks and Recreation Department) in maintaining parks, assisting in community events, and aiding in after-school programs. EnvironMentor - This semester I began volunteering as a mentor with the LSU chapter of EnvironMentors. Mentors in the LSU chapter guide students from Scotlandville Magnet High School in conducting a research project related to the environment with the goal of promoting and strengthening interest in science and environmental research. Coast and Environment Outreach Coordinator - I encourage participation in environmental outreach programs and events to students within the College of the Coast and Environment. Additionally, I help with recruitment of new students into our undergraduate programs. Senator for the College of the Coast and Environment - I was a member of LSU Student Government Senate from November 2013 to August 2014 representing the College of the Coast and Environment. I focused on increasing sustainability on campus and increasing student safety. Some of the projects I participated in were helping improve campus lighting at night and working the LSU Bike Auction. College of the Coast and Environment College Council - In addition to my role in senate, I was a member of College of the Coast and Environment College Council which serves the students of my senior college. Upon leaving my position of senator, I rejoined the College of the Coast and Environment College Council as a member-at-large where I currently serve. Campus Affairs and Sustainability Committee - As a member of the Student Government Senate, I sat on the Campus Affairs and Sustainability Committee, which aimed to increase sustainability efforts on campus. Header photograph was taken by David Fertitta at the Honey Island Swamp in Louisiana.